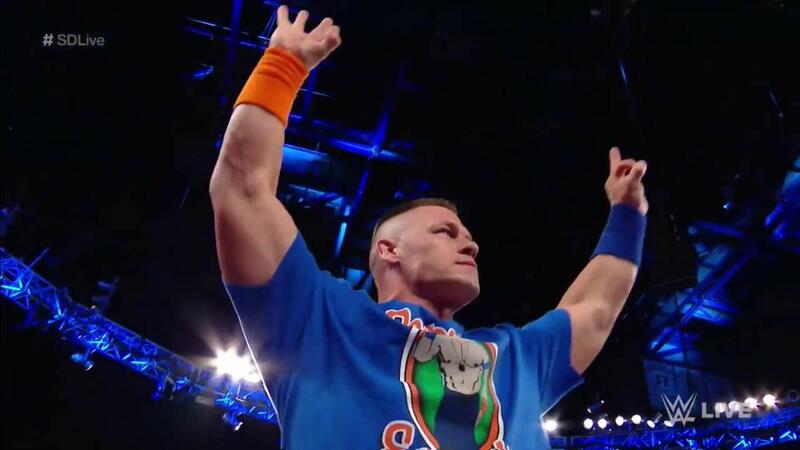 John Cena made his return to start off the night and called out any superstar to come and stop him now that he has forged his path to appear on either RAW or Smackdown Live. He was interrupted by the return of Rusev (and his debut on the blue brand) who was upset about Cena&apos;s comeback commercials while he had to rehab his injury for months with no fanfare. He brought up the video messages he sent to Shane McMahon and now he had come back because he would not wait any longer. He referred to America as a joke so Cena offered to make him the punchline. Cena challenged him to a Flag match tonight but Rusev said they would do it on HIS terms. Cena then sent Rusev away with a "USA" chant. Daniel Bryan offers AJ Styles vs. Chad Gable with the winner entering tonight&apos;s Battle Royale since Kevin Owens has beaten them both and one of them should have to qualify first. 1) AJ Styles def. Chad Gable by pinfall in 8:13 after he hit the Phenomenal Forearm. After the match, Styles helped Gable to his feet and gave him a nod for the hard-fought battle. Mojo Rawley is down after he and Zack Ryder lost their match last week but the latter informs Mojo that they&apos;ll be in the Independence Day Battle Royale. They tease each other about how it will be every man for himself. Miss Money in the Bank Carmella [w /James Ellsworth] came down to the ring for her "Carmellabration" and was interrupted by Women&apos;s Champion Naomi, who referred to James as "Ellsworthless" and brought out Daniel Bryan, who had some words for him. He barred Ellsworth from the arena, fined him $10,000 and suspended him for 30 days on the basis of a threat that if he didn&apos;t obey these rules then Carmella would be stripped of the briefcase. 2) Naomi def. Lana by submission in 7 seconds to retain the Smackdown Women&apos;s Title. After the match, Tamina came down and walked to the back with Lana. Baron Corbin jumped Shinsuke Nakamura in the back before referees broke it up. The Usos and New Day came down to the ring for the rap/off with Wale as the emcee. Both teams had an entourage as well. Of course, it devolves into a huge pull-apart brawl and Wale disqualified the Usos, declaring that the New Day were the winners. Aiden English was upset that Randy Orton interrupted him again so he attacked him and rammed him into the stairs and finished his song. 3) Aiden English def. Randy Orton by DQ in 2:31 when Orton nailed him with steel steps. After the match, Orton continued the onslaught until he was interrupted by WWE Champion Jinder Mahal [w /Singh Brothers], who cut a promo on Orton about their upcoming match at Battleground. Orton fired back with a promo of his own, calling Mahal a "jackass." Tyler Breeze (dressed as &apos;Tenay Young&apos;) interviewed Tye Dillinger, who played along with the joke while Fandango lurked in the background with a hard hat and headphones. Renee Young (the real one) interviewed Mike & Maria Kanellis (complete with the feed cutting out for a while) until Sami Zayn interrupted and mocked him a bit while going on one of his tangents. United States Champion Kevin Owens joined the announce table for color commentary. 4) AJ Styles won the Independence Day Battle Royale in 11:18 when he last eliminated Sami Zayn. After the match, Owens attacked Styles but then got caught with an enzuiguri... and slipped out of the Styles Clash.